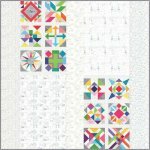 This class is an introduction to fusible applique, free motion thread painting and embellishment techniques. Flowers are perfect subjects to learn these techniques. These are the kickoff meeting dates. Pick one and come!